This time with Seto Kaiba,his Blue Eyes Dragon and in the back the all mighty Obelisk,cause i made a remake of the Malik wall,i have to make the remake of this,another of my all time favorites walls. The concept : when i think in Kaiba with his 2 favorites cards,i remember one episode when Kaiba summons Obelisk in the middle of the city,and all u can see is a big beast in the middle of dark clouds and thunders,so i try to make something like that. First,the sky,is not a normal sky,is a grunge sky,all made with brushes,then i try to add some details like clouds and thunders using some filters(difference clouds and some blur)then,the city,i use parts of the shinta tutorial about making buildings(is the first time that i try,so,feel free to give suggestions) and then just a nice blending of the character and obelisk. lol reb-kun! nyaa~~! i think the details on the buidling needs to be a little more faint to make it look like it's in the distance, if not add more buidings to make it look more like a city. some faint details on the railings would be nice. doesn't have to be uber detailed and visible though ^___^ just faint :3 but the sky is awesome ^___^ great job on that! A wallpaper dedicated to me? OMG **Gasps** I love it! And this wallpaper caught my full attention too! ROFL - Thanks Rebel! In any case, who would ever forget your very first YGO wallpaper? That really rocked! But this one? Even better! Most likely, it was the grunge background that I really liked. You blended the character in very well. I have to admit, that's some great work you've placed in this wallpaper, and it's worth every effort, perhaps even more! I really love the background. The emphasis on it is incredible. To tell you the truth - your grunge style is great, and a big bonus, believe me! Yep, that's Rebel, for ya! lol - Stick that with 2D buildings, and err... yeah, you get the picture. lol - The 2D buildings aren't really a plus column for me over here. Same goes with the font. However, it does add a nice simple, clean feel to the whole visual concept, though. Nonetheless, it rocks! Seto looks so cool with that Blue Eyes With Dragon written all over him. Haha! My cousin would be thrilled taking this wallpaper and placing it on her screen. **Cranks up the music and listens on her headphones** Rock on! woah...the bg is so cool!! i like the colors^^ the scan of kaiba and his blue eyes white dragon is so cool!! thanx a lot for the artwork! hm... only one thing i'm not comfort with that... the buildings behind... look so dead and flat... in my dumb thinking... it gives me a feeling that it spoil the whole picture of it... juz the building... other than that are juz prefect!! The nly thing that needs work is the buildings which need to have different windows and lines thats all, Hmmm for some reason the BLue eyes white dragon needs wings if it had in the original scan but maybe it needs that but nonethrless the bg at the back is the best....Love how they all go together... Obelisk the tormentor arise!! Mwuahahha! ooooo, ur making a YGO series, huh ^^ no wunda theres anotha YGO wallie, and a good one too xD well, great scan and good idea on puttin Obesilk on the dark sky. only thing im confused about is the bottom, is it a rail? cuz it sure dun look like it ^^"
whoa! great YGO wallie rebel! Like the blue, the concept . And the building is alright in my opinion. u just have to enhance its compositiion. Nonetheless a nice wall ^_^. Background looks awesome~ love love love~ Kaiba was so funny XD Love the whole structure, looks really good, and the effects with tints and texture look really good. Love it! Loving those eyes hidden back there and the texture really sets the dark mood to this. The buildings don't seem suitable at all and in effect kind of negate the wonderful job you did on the sky and take away focus from the character scan. Would've been cool to see some other effects to bring this to life in place of the buildings. 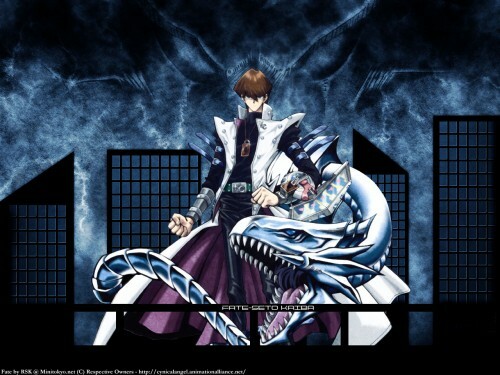 Seto Kaiba rocks Blue Eyes white dragon strongest duel monster! the background matchs the blue eyes white dragon's color! Having Obelisk in the background is really cool!